Super Thin, Light and Mobile? "Even more mobile, more elegant and considerably more efficient than any other netbook" - so much to the comparatives with which Toshiba promotes the T130 on its homepage. 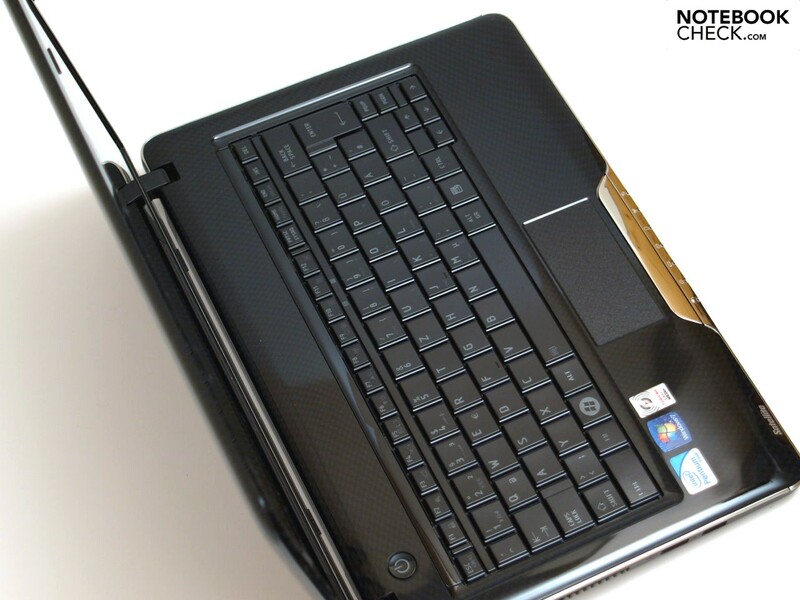 This laptop can't be placed into the category of netbooks already just because of its 13.3 inch size and thus actually participates in the subnotebook league. 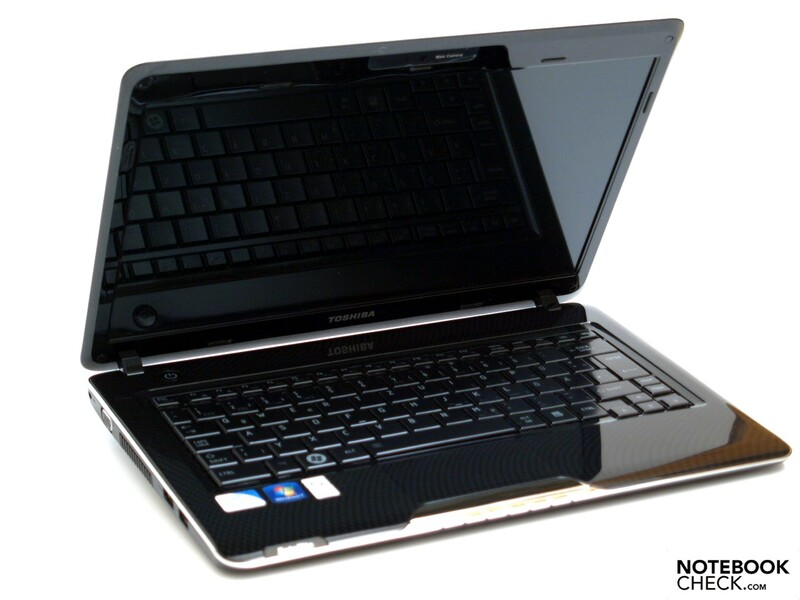 The built-in Intel Pentium SU4100 processor, a four gigabyte DDR3 RAM and the Intel GMA 4500 chip set graphics promise more than only "netbook power". In the best case, there should also be enough mobility supplied with a announced battery life of up to 10 hours. The following review shows how the Satellite T130 sustains in practice. Currently, the Satellite T130 range is made up of 3 models in Germany and Austria. 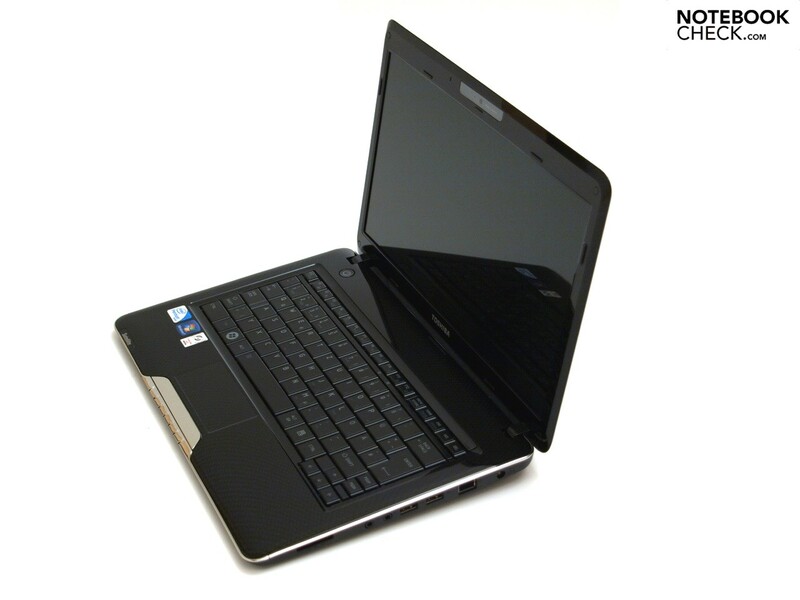 These differ in terms of CPU (Pentium SU2700 or Pentium SU4100), hard disk size and available Bluetooth option. Because both processors show the same power dissipation, it's unlikely that there will be a difference in relation to battery life or emissions in the single models. However, the SU4100 can serve with two computer cores in comparison to the SU2700 so that more performance is awaited from the models equipped with the dual-core CPU, depending on the application. You already find a larger model range in the United Kingdom. 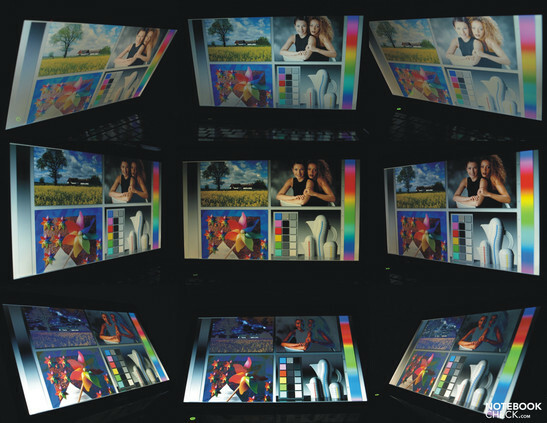 Aside from a further processor option, Intel's Core 2 Solo ULV SU3500 CPU, there is also a larger variety in view of colors. In return, the corresponding models are labeled with Satellite T135 in the USA. 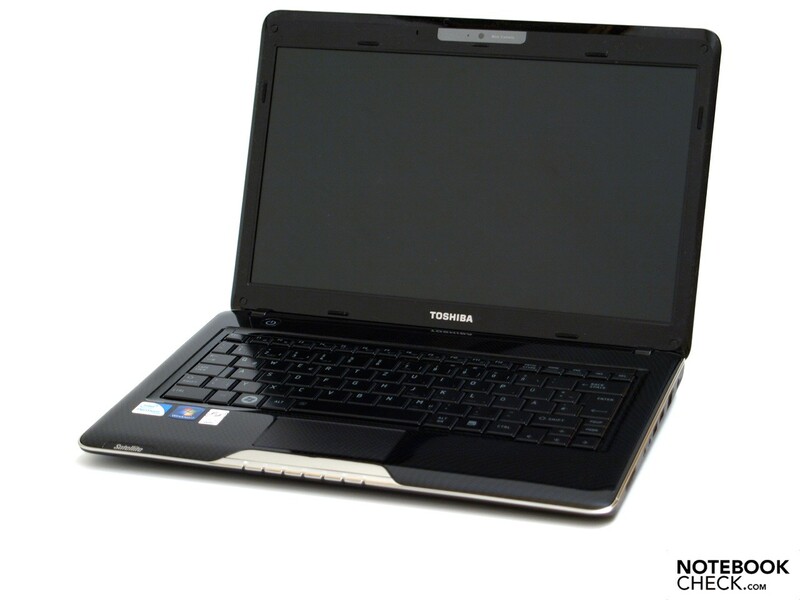 The model T135-S1310 majorly complies with our Toshiba Satellite T130-14T prototype. You have to make do with a smaller hard disk that has a capacity of "only" 320 GB in the USA's model. In opposition, the Austrian/German top model bids even more place for user data with 500 GB. As already mentioned in the beginning, the T130 is only available in black (Precious Black) in Germany/Austria. Aside from that, red and white models with the name "Iron Red Metallic" and "Luxe White Pearl" are offered in the UK. At first sight, the high-gloss black model with a checkerboard-like texture on the display lid and on the upper side of the base unit, as well as the chrome rim there, in fact, look very elegant. But it's not easy to clean. Very obvious dust particles and fingerprints were already collected on these surfaces within a short time. The base unit, with only plastic surfaces, proves to have a high torsional resistance and to be sufficiently stable. However, the wrist-rest yields even under slight pressure, whereby sometimes there is a snapping audible. The battery also doesn't sit absolutely tight in the case and can easily be moved back and forth. The very thin display lid only replies with medium twisting when it's picked up at a corner but it partly creaks. However, image changes on an activated display couldn't be observed when doing so. The display lid can handle selective pressure from outside much better. The small self-closing hinges only allow a singlehanded closing. You have to use both hands for opening though, also especially because of the light base unit. The screen teeters obviously after adjusting the opening angle. Additionally, the notebook has its problems on an instable work surface, such as a train journey. The maximum opening angle is restricted to about 125 degrees. A transport latch has been omitted, likely for reasons of design. But the hinges' traction isn't strong enough to prevent the closed device, held vice versa on the base unit, from opening. 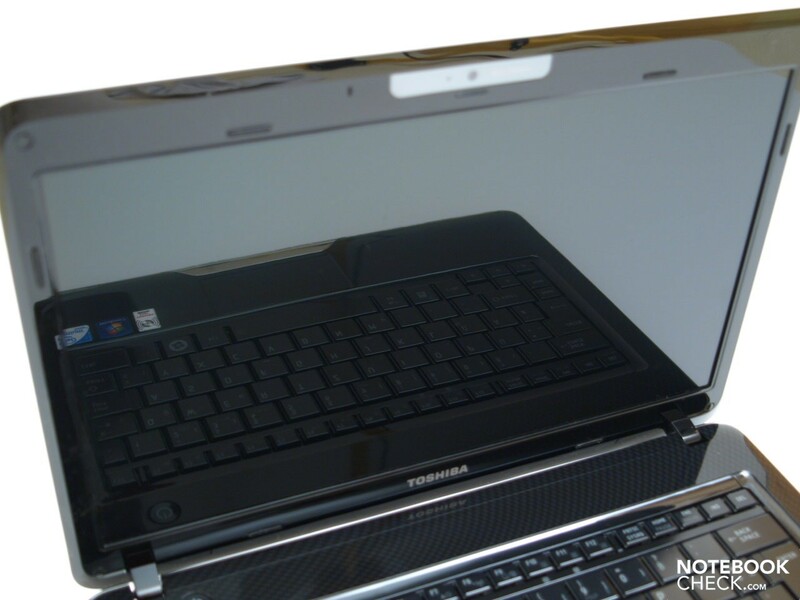 Therefore, it's recommendable to transport the laptop in its own cover, so to prevent foreign objects from penetrating between keyboard and display. 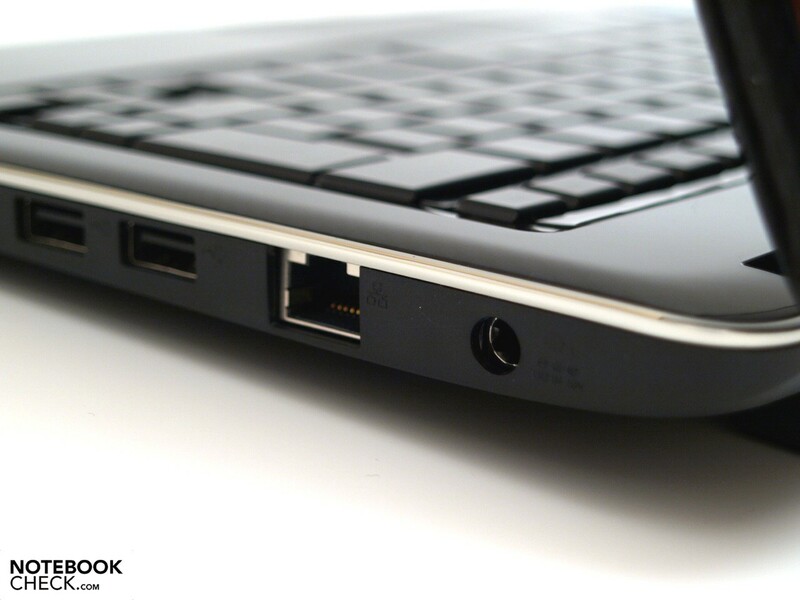 The connectivity has everything that you can expect from a notebook of this size aligned for "home computing". Aside from an analog VGA port, it also has an HDMI for digital audio and video transmission, whereby you could connect a suitable TV without further ado. Unfortunately, an internal DVD drive has been omitted due to the slim design. This means that you actually have to connect an external DVD drive in order to enjoy DVD movies on the TV. Regrettably, an eSATA for better transmission rates than via USB isn't onboard, either. The integrated 5-in-1 cardreader supports SD cards up to 16 GB, memory sticks up to 256 MB, memory sticks pro up to 4 GB, Multimedia cards up to 1 GB and xD picture cards up to 2 GB. 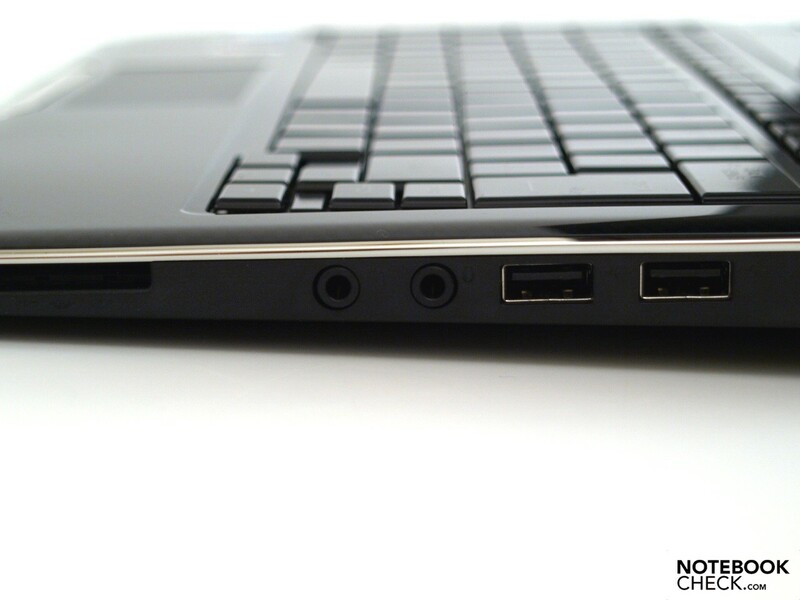 Both often permanently occupied ports, LAN and VGA, are found in the rear area of both lateral edges, but lefties might have to struggle with a work place restriction when an HDMI cable is connected or the USB port, found on the front left edge's area, is used. However, this USB port is capable of a so-called sleep and charge mode, with which connected USB devices, such as digital audio players, can be charged via the USB interface even when the laptop is deactivated. This function has to be enabled in the BIOS, though. Windows 7 also bids support for an according tool. On the right, you find two of the 3 USB ports and both audio sockets in the center area. An Atheros AR8132 PCI-E Fast Ethernet Controller (10/100MBit) is available as cable-bound network connection. WiFi hotspot connections can be built up via Realtek's RTL8191SE Wireless LAN 802.11n PCI-E NIC. 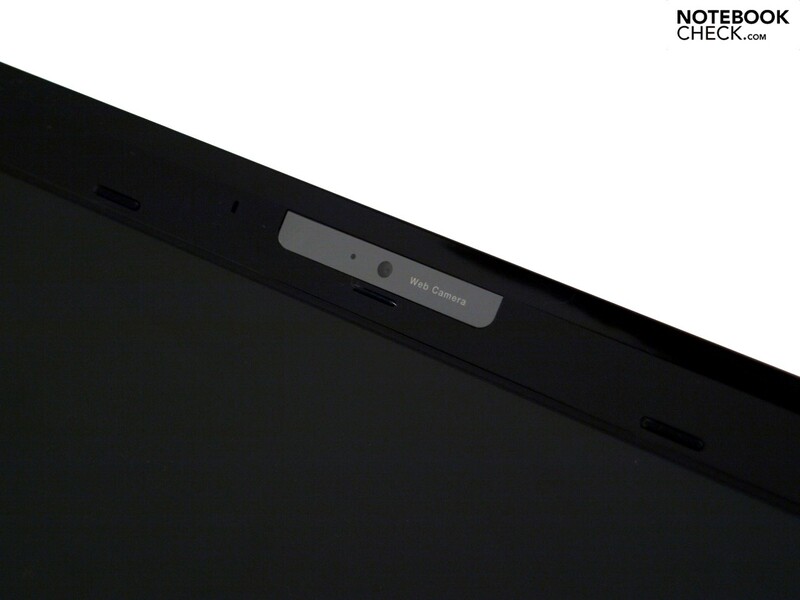 Video telephony isn't a problem with the VGA webcam built-in on the upper display frame. Bluetooth V2.1+EDR aren't onboard in all models. However, the T130-T14 model, beside others, has these and makes it possible to communicate with small mobile appliances, such as PDAs, cell phones, etc. 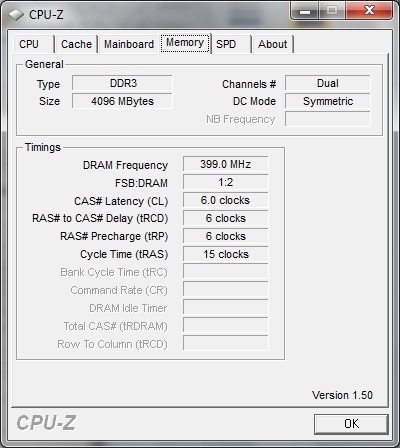 The integrated four gigabyte RAM is efficiently used by the preinstalled Windows 7 Home Premium 64 bit so that the so-called total real memory is 3.84 GB. 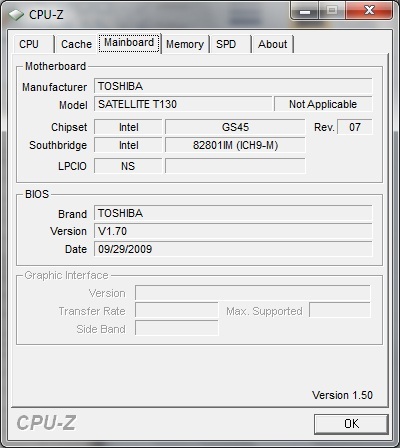 Toshiba doesn't list any further operating system options. A recovery data carrier isn't found in the scope of delivery, either. 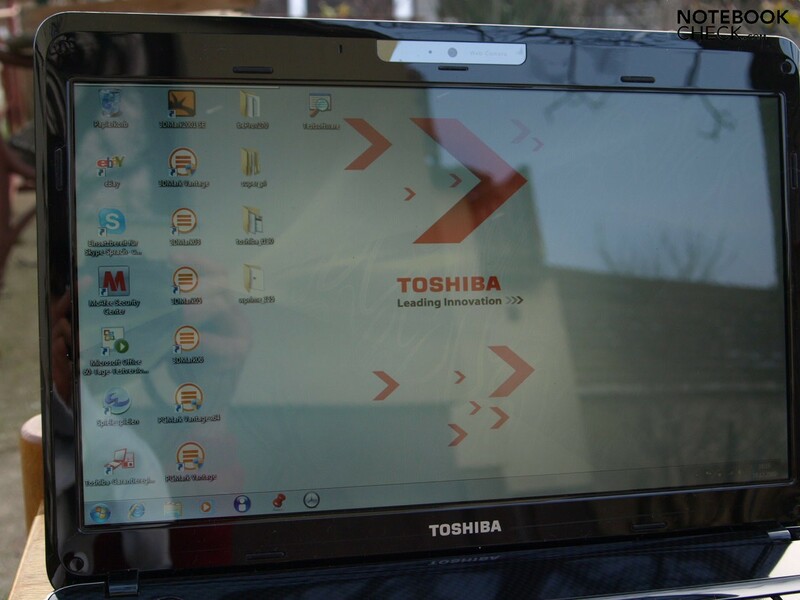 Thus, it's recommendable to create one right after the first system start with the preinstalled Toshiba Recover Media Creator Tool, so that you have it just in case. Not only can you create recovery DVDs with it but also bootable USB flash media, whereas a minimum capacity of 6.4 GB is required. According to the electronic manual, such a recovery should also be possible from a hidden partition as long as the hard disk isn't defect. 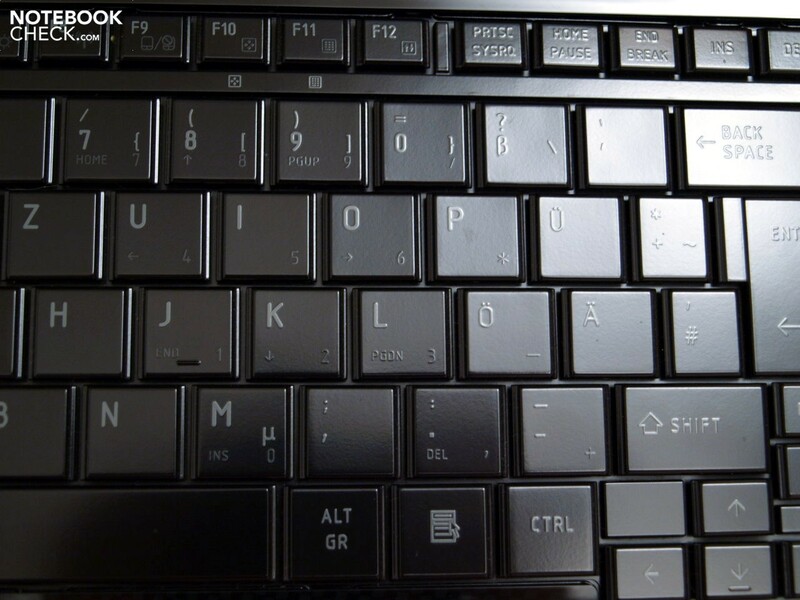 To use this, you're supposed to press the function key "F8" during the boot process, choose "Repair my Computer" and then follow the instructions on the display. However, pressing "F8" didn't show any effect on our prototype: Windows 7 boots normally, as usual. Other listed options after display activation, like "F2" for BIOS or "F12" for changing the boot device work normally. "F8" is also not listed as an option - too bad! Even in the tester's opinion, a resetting to state of delivery by recovery via hidden partition is still the most comfortable and fastest method to clean the notebook before sending it back. 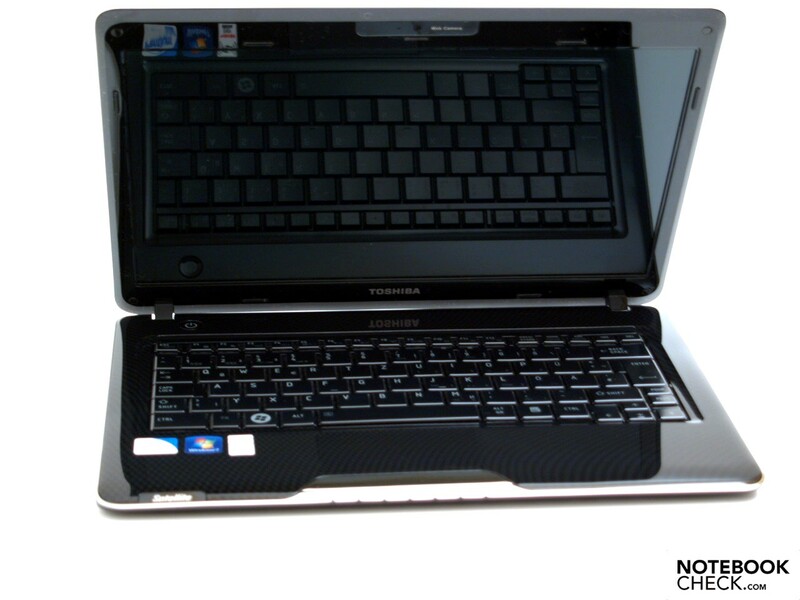 Toshiba offers a 2 year international bring-in manufacturer warranty (Europe, Middle East, Africa) including on-site pickup service in Germany and Austria by registering the repair on Toshiba's notebook hotline. According to the manufacturer's site, the standard layout has been made in matt black. We didn't quite see it this way. The keys aren't as glossy as the surrounding components, but the smooth, haptically not really appealing surfaces seem everything else but matt. You can be satisfied with the mechanical traits of the keys: medium long stroke length and a distinct pressure point. The keyboard even stays pleasantly quiet at vigorous typing; however the base coils a bit while doing so. The touchpad with a width of 79 millimeters and a height of 38 millimeters is slightly lower than the surrounding components and its borders can be well felt by the beveled edges. The wrist-rest material and texture is continued on its surface, which has been slightly roughened. But its haptical traits aren't optimal. As long as you don't unintentionally activate one of the supported multi-touch features, or the neither optically nor haptically marked vertical scroll area, you can control the mouse cursor precisely. This is quite annoying in the beginning but after a bit of getting used to, you get along with this touchpad quite well. Both correlating keys are hidden underneath the chrome bar in front of it. They respond well, whereas a click noise and stroke length turns out differently depending on the point of pressure. There is a fairly large, invisible dead zone between both keys. The mouse substitute can simply be disabled with the FN + F9 keys if required. You'll find a reflective 13.3 inch display with a maximum resolution of 1366x768 pixels in the Satellite and thus, in a cinematic friendly 16:9 format. This is often rather more suitable for home movie use than frequent vertically aligned applications, like internet surfing, word processing, etc. For the latter, a bit more image height would be an advantage. 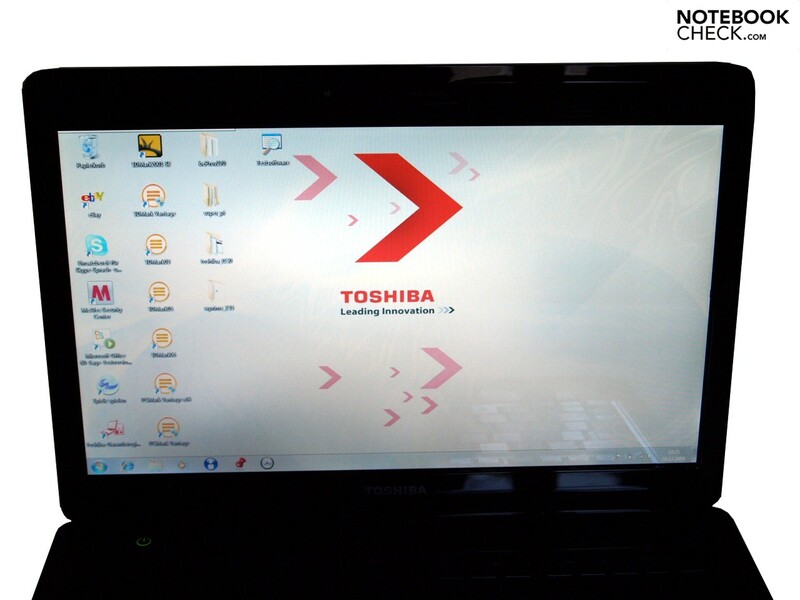 According to the manufacturer, it's a Toshiba TruBrite HD TFT high-brightness display with an LED backlight. We've established a good maximum brightness of 218 cd/m2 - but only in the center area. From there, the brightness decreases in all directions, but especially upwards. We could record a brightness of an only mediocre 159.7 cd/m2 in the upper center sector. A fairly uneven illumination of 73% is a further result of that. Naturally, the color representation is subjective; the image is generally focused. There is practically no shading visible for the naked eye on large scale white surfaces, despite the not ideal illumination in terms of figures. The representation of black is subjectively difficult to judge due to the glossy surface. The black value is fairly high in the center display sector with 1.31 cd/m2, though. As to the contrast value evaluation, the notebook benefits from the fact that its maximum brightness has been measured in the center display segment. But the assessed maximum contrast ratio of 166:1 is pretty low, anyway. The notebook is only suitable for a makeshift outdoor use due to the reflective surface. This disadvantage is similar but less striking indoors, especially in adverse light incidence. It becomes obvious here that the Satellite has been developed for home use and not i.e. for professional fields. The viewing angles don't show big deviations in comparison to most competitors. Once again, the horizontal work plane is fairly generous, whereas you have to count with increasing reflections the more obtuse the viewing angle is. The stable area is very tight on the vertical plane, as it's usual for the category. The readability decreases fast outside of this due to contrast loss and color changes. 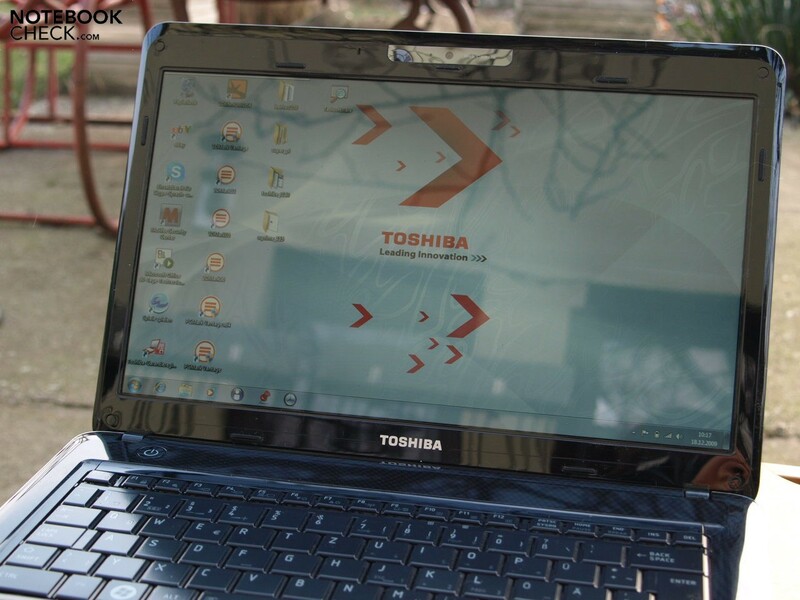 A focus has been placed on energy saving in the Toshiba T130's configuration. But the most inefficient hardware hasn't been chosen, either. Our prototype has even been treated to a state-of-the-art energy saving two core processor with the name of Pentium SU4100 CPU from Intel (-> manufacturer's link) with a 2MB cache, 1.30 GHz and 800 MHz FSB. The CPU manufactured in a 45 nanometer process has a moderate power dissipation of 10 watt. As already mentioned above, there are a few model-dependent alternatives in terms of the CPU configuration. A model-independent Intel GMA 4500M graphic chip set is responsible for graphic issues. Technically, it's a lower clocked GMA 4500M HD, whereby the performance isn't enough for a full BluRay support anymore. Despite that, the chip can decode HD videos (but possibly not all 1080p smoothly). 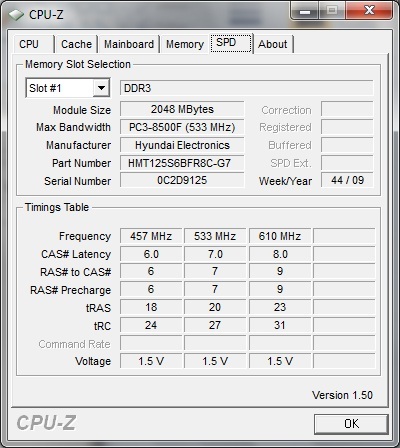 At the same time, our prototype has the maximum configuration level with a four gigabyte DDR3 RAM. 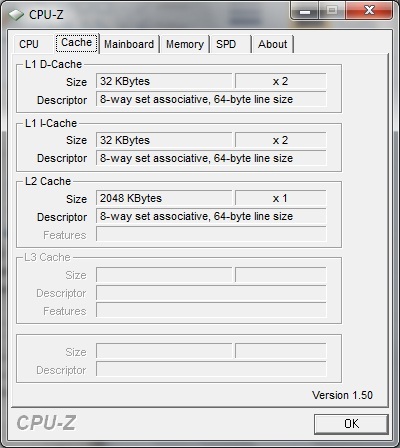 The main memory can also be used efficiently due to the preinstalled Windows 7 Home Premium 64 bit version (total real memory: 3.84 GB). Less strongly equipped models can easily be upgraded via the maintenance cover on the bottom. The DPC latencies indicate the waiting period of DPCs (Dereffered Procedure Calls) in the DPC line. 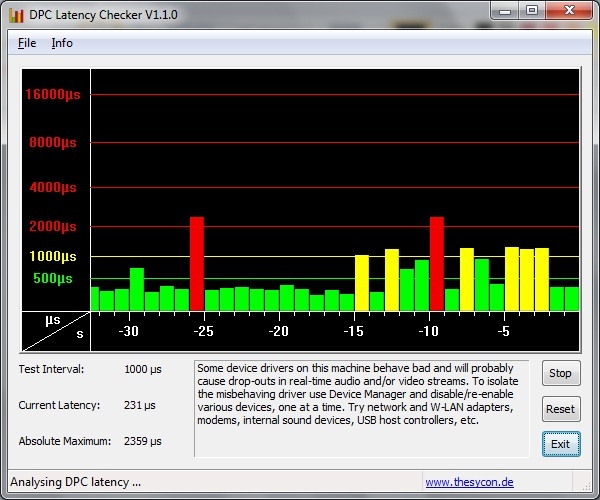 The latencies could turn out too long in case of erroneous drivers and cause problems with connected external devices, such as sound crackling of external audio cards. The latencies repeatedly exceed the 1000µs mark so that such are likely. The troublemaker can be found out by selectively disabling single drivers and a driver update could solve the problem. 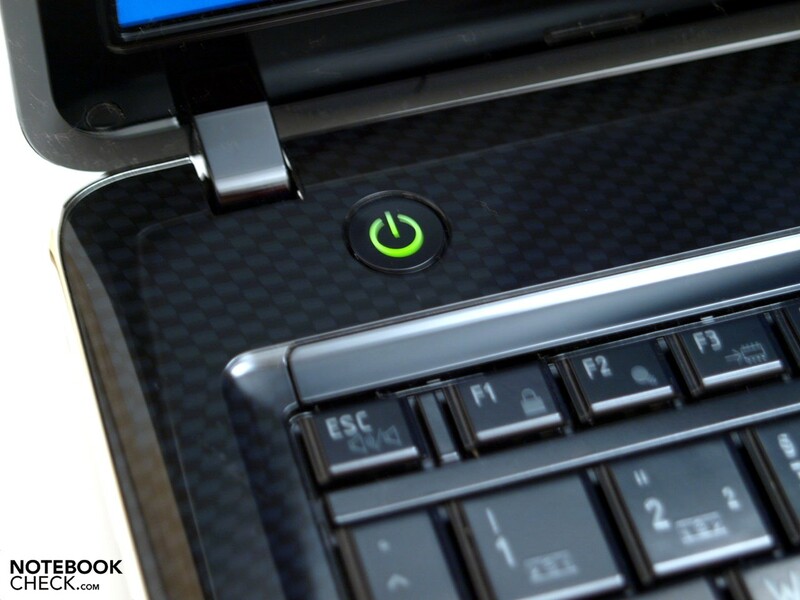 The T130's application performance complies with our expectations for notebooks with this configuration. It achieves a total rate of 2597 points in the PCMark Vantage test. 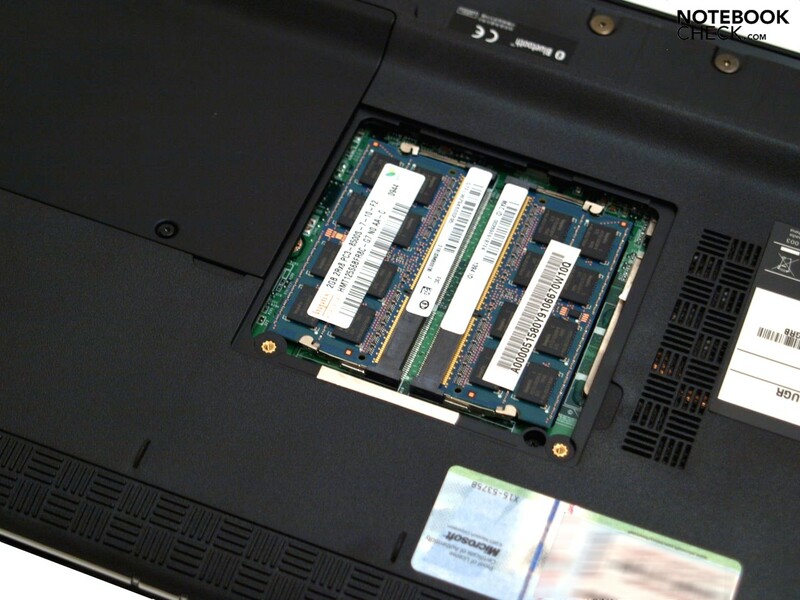 Notebooks with a comparable configuration, but a more efficient GMA 4500M HD, have an advantage here. 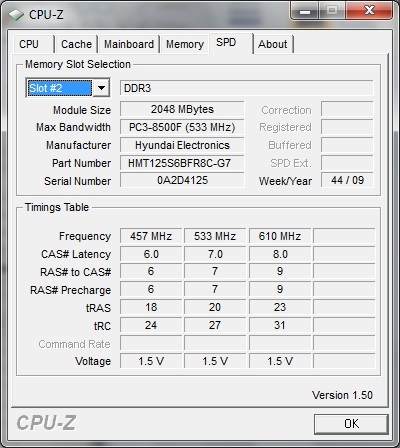 For example, the Asus UL30A achieves +4% in PCMark Vantage and +6% (single thread) and +11% (multi thread) in the CPU biased rendering test of Cinebench R10, whereby the Intel Core 2 Duo SU7300 built into the Asus laptop has a larger level 2 cache. The gaming performance, or rather the GMA 4500 M graphic chip set's 3D graphic performance, is fairly modest and due to the low clocked processor it's even likely that undemanding games in low detail levels won't run completely smoothly. Then again, the Asus UL30A can show off with +15% in 3DMark03 and +14% 3DMark06. More information about gaming performance can be found in our game list or our special editorial "CPU performance for games". However, the graphic performance is completely sufficient for 2D applications, like office, internet surfing or image editing and it hasn't got any problems with the Windows 7 desktop. Summarizing, it can be said that the prototype has a sufficient application performance. The large main memory capacity in form of two fast two GB DDR3 modules proves to be an advantage, depending on the application. You should avoid graphic intensive applications, though. 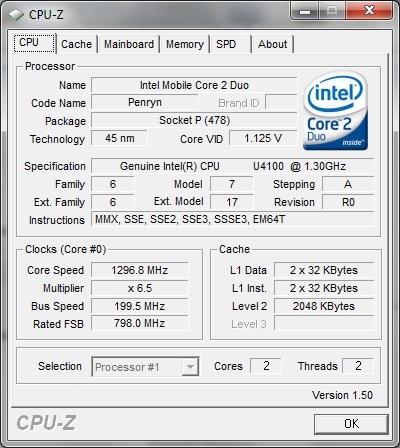 The prototype's two core processor additionally has advantages especially in multitasking and multi-threading in comparison to models with an Intel Pentium SU 2700 single-core processor. The Toshiba Satellite T130 has, depending on the model, only common but differently sized 5400 rpm hard disks as a mass memory. These are, however, protected against damage by jolts with a sensor. 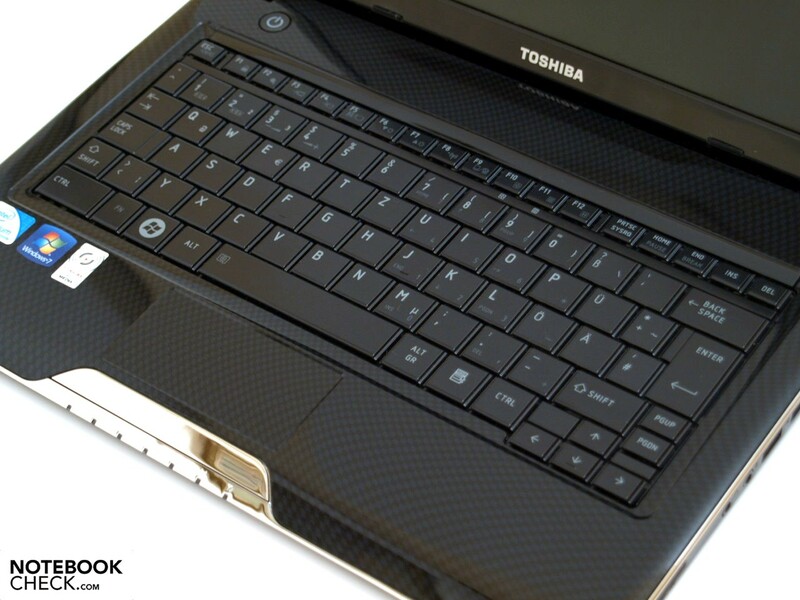 To be more precise, an MK5055GSX was in our prototype, unsurprisingly also from Toshiba. 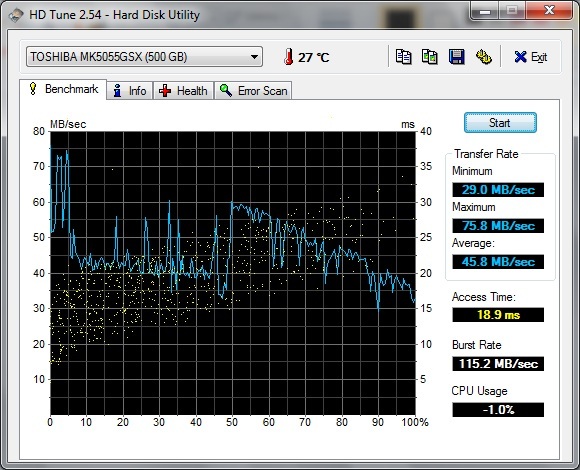 The hard disk's performance data is inconspicuous. There is also a second maintenance cover on the notebook's bottom. Presumably, the hard disk is behind it in view of the size. But because it's been fixed with Torx screws, we couldn't open it for lack of an appropriate screwdriver. You won't find an internal optical drive. You can, however connect an DVD drive easily via USB. In return, BluRay isn't really sensible already because the graphic card doesn't have enough performance - apart from that, USB bids far poorer transmission rates than eSATA. 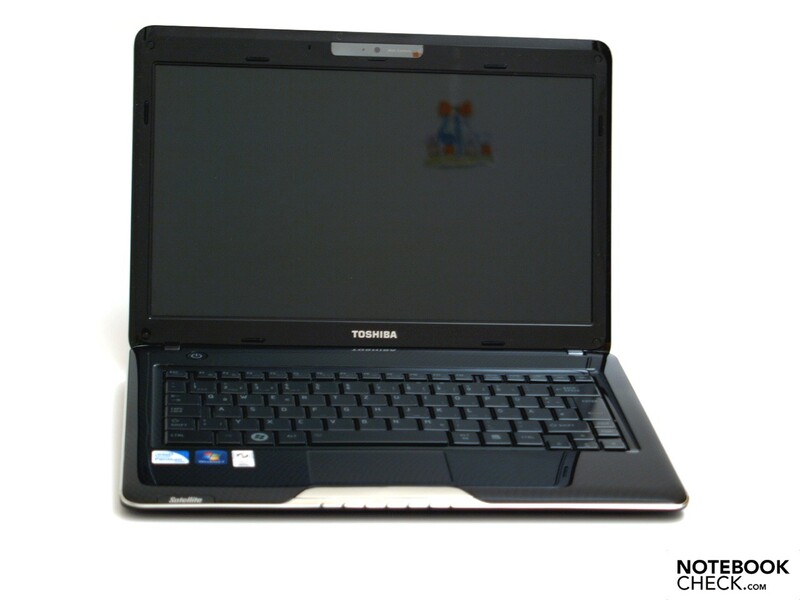 The Toshiba Satellite T130 belongs to the quiet laptops with a maximum of 34.1 dB(A) under load. We recorded the lowest noise level with 30.6 dB(A) under low load. There isn't anything striking about the soundscape. 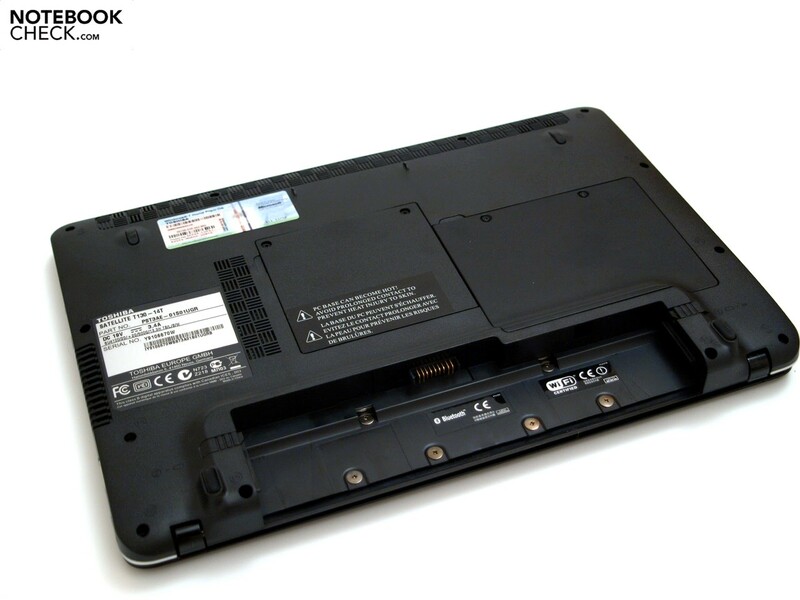 The notebook benefits from use of components with a low power dissipation (Thermal Design Power) because they also need less cooling performance. Obviously, Toshiba has accepted a higher temperature increase in favor of the operating noise. 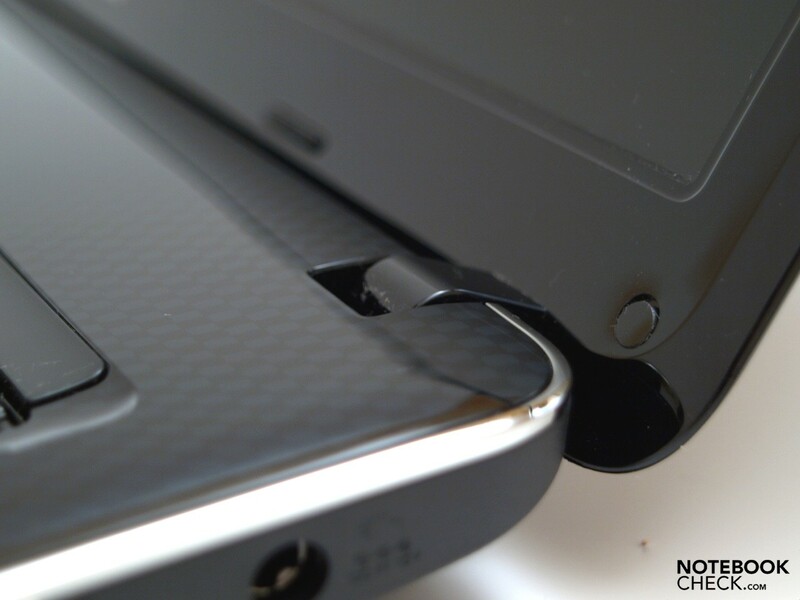 Thereby, one disadvantage of the ultra slim design becomes evident. The air inside the case can't circulate very well due to the tight place conditions. Additionally, the plastic case can't distribute the heat development as good as usually more expensive competitor notebooks with a metallic surface (magnesium alloy or aluminum). Thus, hotter areas develop to a part, especially in the louver's area on the left lateral edge. We assessed the maximum of 46.7 degrees Celsius on the bottom, in the above mentioned area, after high load operating of more than one hour. We recorded 43.5 degrees Celsius for the correlating upper area, so the left keyboard area, which is the top temperature here. 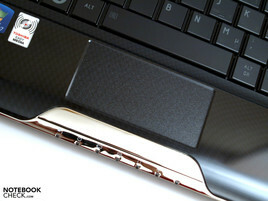 The temperature of the wrist-rest and touchpad still stay within a limit with a maximum of 37.7 degrees Celsius. To be fair, we should mention that a permanent full load use or use under a high capacity, as for instance in cutting edge, 3D demanding computer games, is very unlikely for a laptop with this configuration. The upper side stayed overall considerably under normal body temperature after two hours of idle mode with maximum energy savings options. We recorded a peak value of 38.9 degrees Celsius on the bottom's left front sector. Thus, the notebook regrettably will likely be too warm even under low to medium load, and depending on the sensitivity, for a constant mobile use on the lap. (±) The average temperature for the upper side under maximal load is 35 °C / 95 F, compared to the average of 30.7 °C / 87 F for the devices in the class Subnotebook. (-) The average temperature of the palmrest area of similar devices was 28.6 °C / 83.5 F (-9.1 °C / -16.4 F). Both loudspeakers are found under the beveled front edge and therefore emit their sound more or less towards the table's surface. The maximum volume is relatively low and sufficient for small rooms at best. The sound stays clear even with maximum volume and fairly balanced, apart from weak basses, despite "Toshiba Bass". The 3.5mm audio socket test was inconspicuous so that connecting external loudspeakers or high-end headphones would seem to be recommendable for sound improvement. 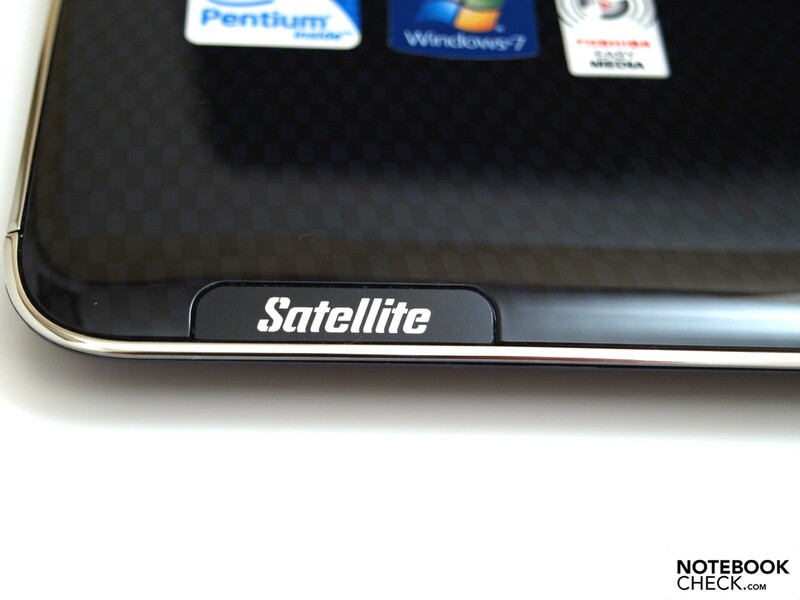 A fairly long battery life belongs to one of the Satellite T130 model's strengths. However, with a maximum of almost 10 hours including maximum energy savings options, minimum brightness and disabled wireless modules, it can't even get close to extremely long-lasting notebooks, like MSI's Wind U155, which is in the lead on our list of the longest battery runtimes with almost 17 hours, but at the cost of system performance. The Asus UL30A also competes with a comparable performance and similar system configuration. It achieves a battery life of 15 hours and 20 minutes with a 84 Wh battery and thus has the second place. Our Toshiba prototype can't really keep up with that because of a 6 cell lithium ion battery with "only" a capacity of 61 Wh. In the best case, the Asus UL30A reaches a 63% longer battery runtime due to the 38% larger battery. 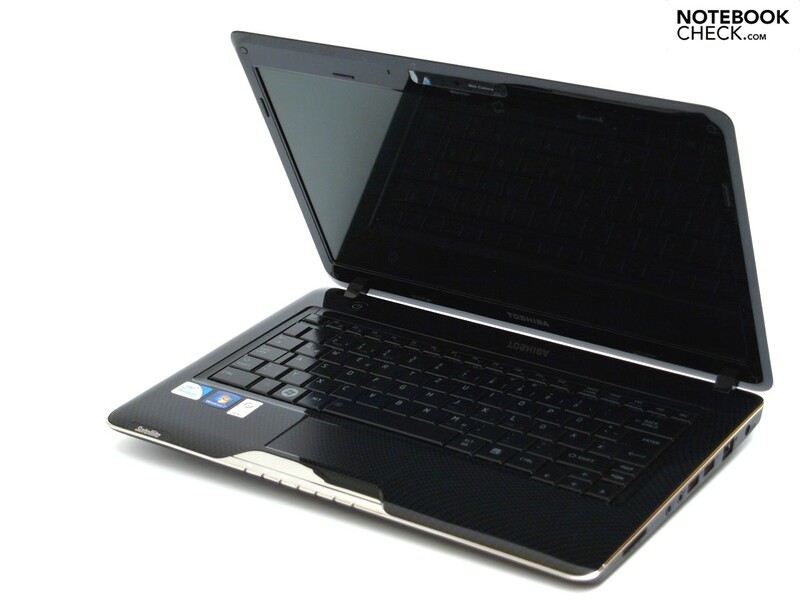 The Acer Aspire 1810TZ, an 11 incher with a similar hardware configuration but only a 1GB DDR2 RAM and even GMA 4500M HD, competes with an about equally strong battery (63 WH) and comparable components and achieves a 25% better battery life. 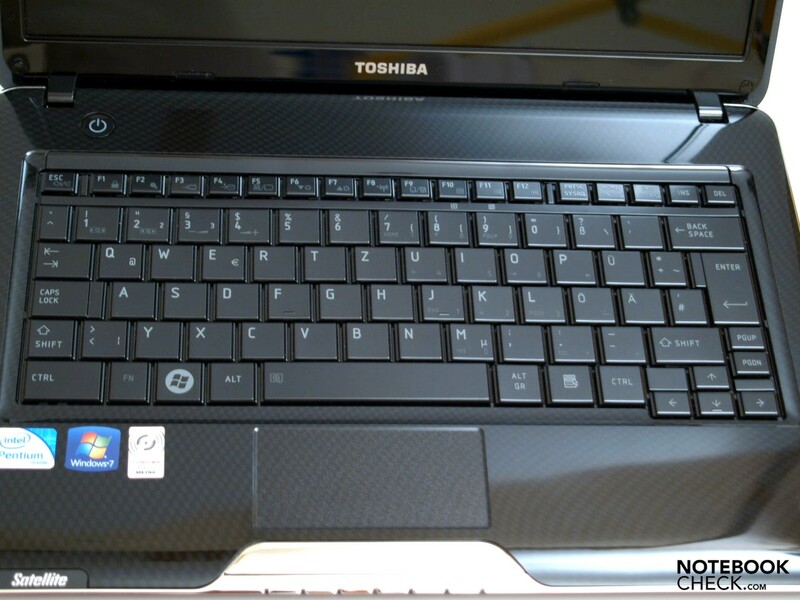 We continue our comparison with an Aspire 1810TZ. 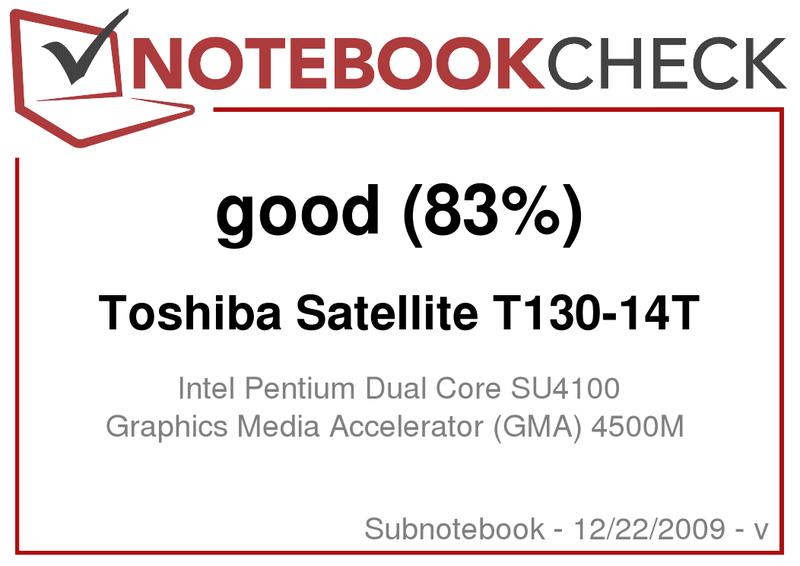 The Toshiba Satellite T130 also has an inferior score in this category, with +23% for the Acer notebook in full load operation and +17% also for Acer. The BatteryEater Classic test under full load with maximum brightness and enabled wireless modules records 179 minutes as the minimum possible battery runtime of the prototype. About 297 minutes of internet applications remote from the mains with maximum display brightness is possible in practical WLAN use. 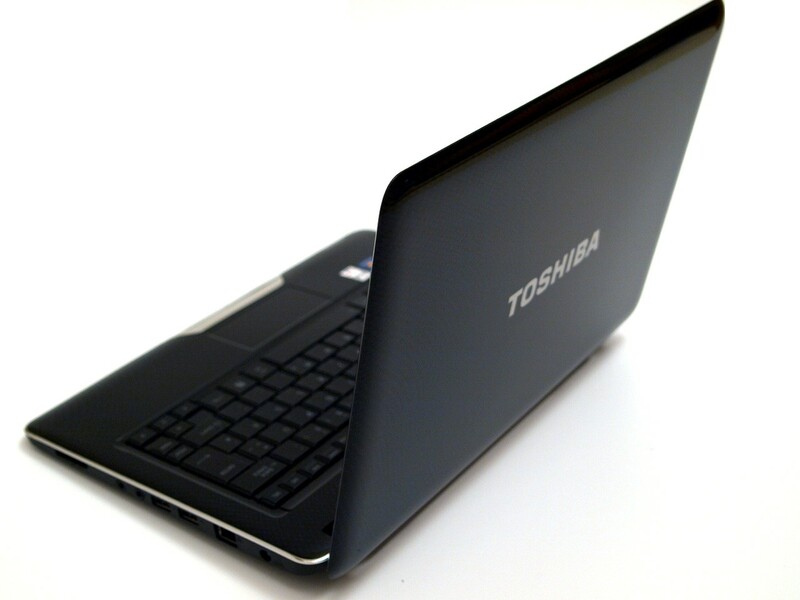 The maximum power consumption of Toshiba's prototype is 27 watts and thus considerably higher than Asus' UL30A (+55%). We assessed 6.0 watts, so +36%, in comparison to the UL30A when the Pentium SU4100 hasn't got anything to do and the maximum energy savings mechanisms are enabled. Especially pleasing is that the Toshiba Satellite T130 belongs to those notebooks that only use 0.1 watts in standby mode. 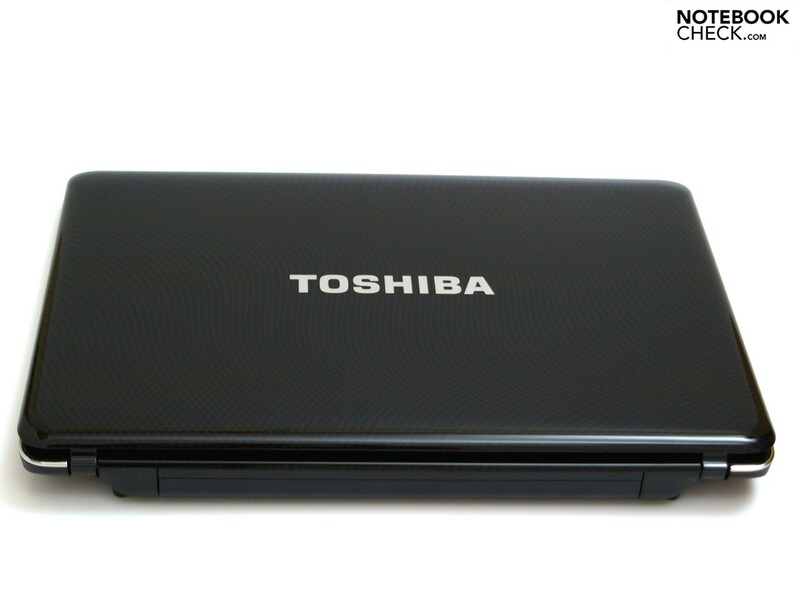 Toshiba has given the Satellite T130 a touch of elegance, which attracts dirt particles magically, though. It's covered by dust particles within the shortest time even without the user's influence. 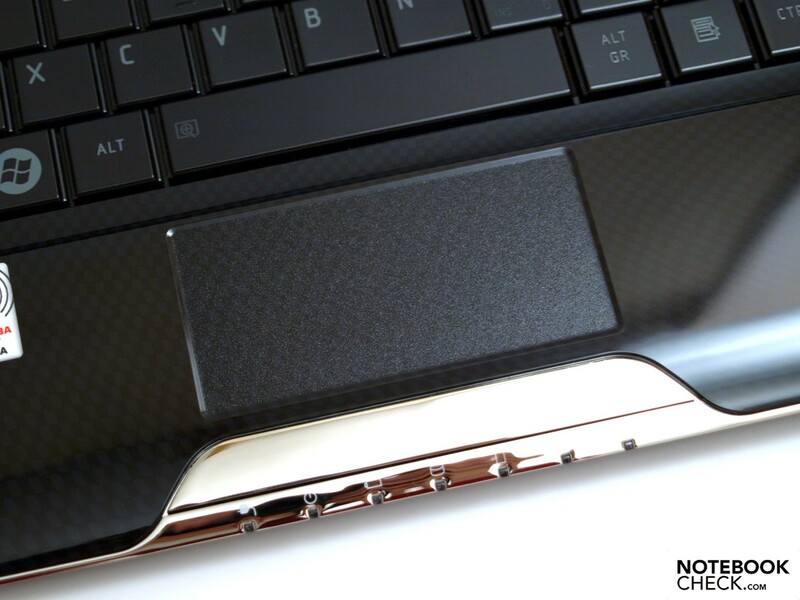 The high gloss finish also has a negative impact on the wrist-rest's and input device's haptic. While we're satisfied with the keyboard's typing comfort, the touchpad proves to be quite needy of getting used to in the beginning. Further disadvantages of the plastic slimline case join in. An optical drive had to be omitted due to space reasons and the temperature development isn't optimal, either. 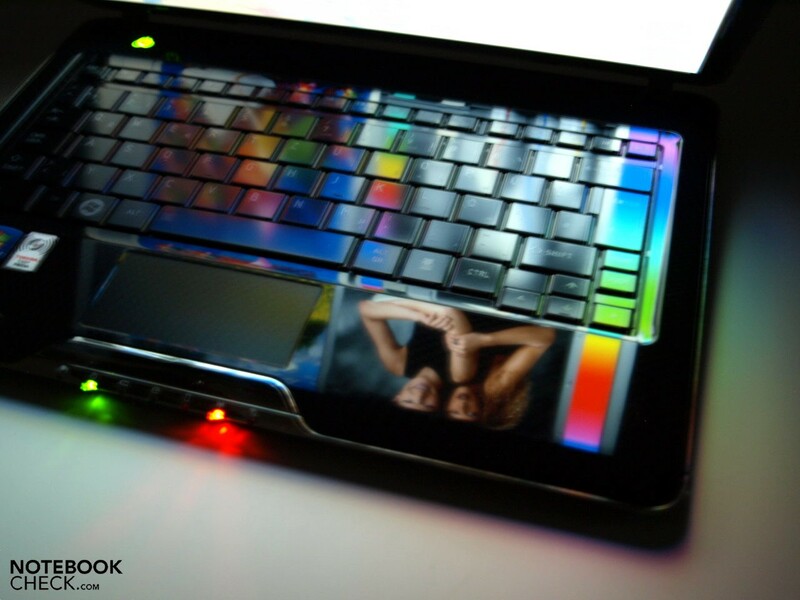 The laptop's mobility is unnecessarily restricted by the reflective display. The high gloss surface also can't conceal its measured data, which is partly worthy of improvement. But the Satellite T130 scores with its long battery life and low power consumption. You can also be satisfied with the application performance. The 13.3 incher is aimed at end users with a focus on a long battery life and sufficient application performance. In return, it's first apt for excessive home movie use when an external DVD drive is attached to it. However, this can only be connected via an USB port. But you can enjoy movies on an accordingly equipped TV set thanks to HDMI. The deactivated Satellite T130 can charge small appliances, such as audio players, with the sleep and charge function of the left USB port. But compared to the similarly equipped UL30A from Asus, it doesn't score as well in terms of battery life, performance as well as the value for money ratio. An HDMI connection and an USB port with a sleep and charge function are found on the front left side. A lighted power switch supplies information about the operating state. 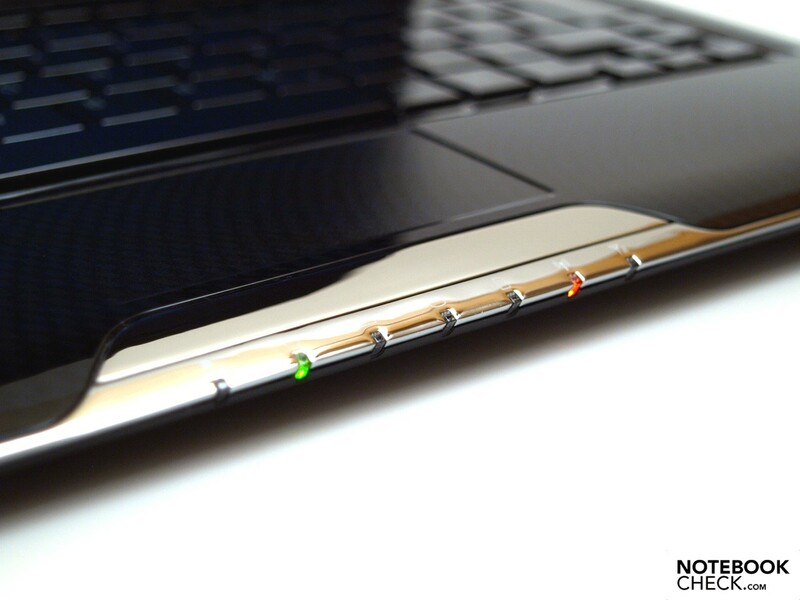 The status LEDs have been nicely integrated into the chrome bar. You can also create nice mirror effects with the high-gloss surfaces. 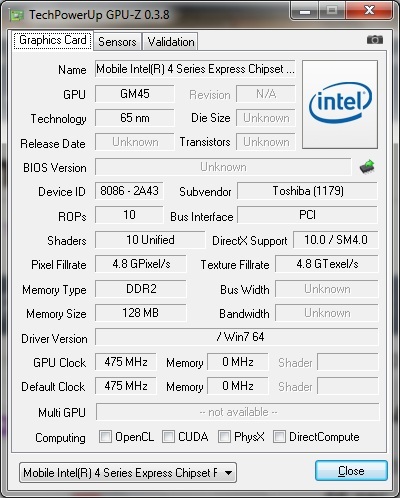 The application performance is good, due to Intel's Pentium SU4100 CPU, GMA 4500M graphic chip set and a 4 GB RAM. Main memory replacement is made easy by a maintenance cover. The bottom side heats up quite intensely, especially under load. But the device is quiet. 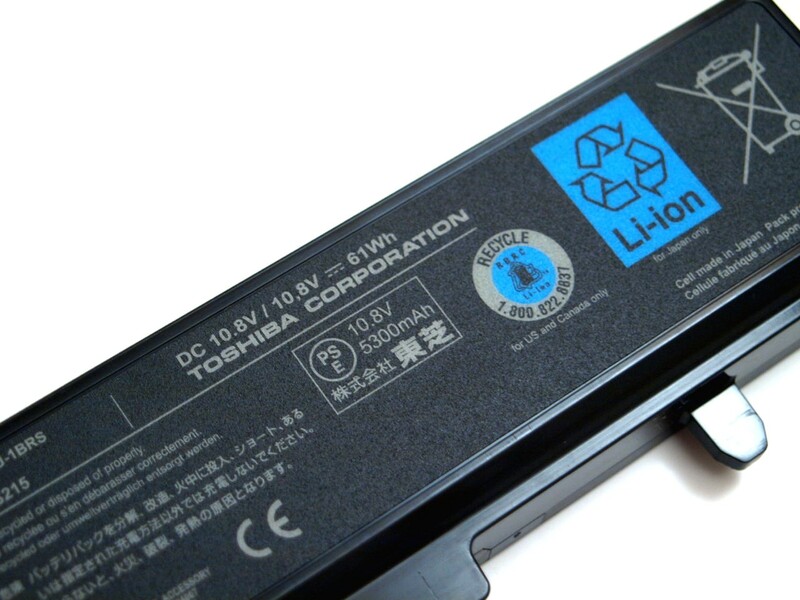 The 61 WH lithium ion battery supplies a good battery life. ... and wrist rest prove to be susceptible for smudge. ... pleasant and has an integrated numerical field. The touchpad with multi-touch features is a bit unusual in the beginning. ... and in adverse light conditions. There is a webcam on its upper display edge. Face recognition is also included. Both loudspeakers built-in under the beveled front edge bid a quiet but clear sound with little bass. There is a vast amount of similarly equipped 13.3 inch notebooks. For instance, Asus' UL30A, which has a considerably better battery life with a larger battery and bids somewhat better performance rates. Further models can be seen in "Similar Notebooks".